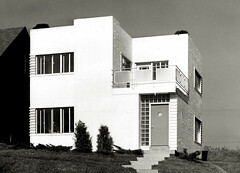 Photograph of Deffaa Residence, c. 1937. Armstrong designed this small brick masonry home in 1937 for the Deffaa family. The house is located at the end of a street at the top of a rise overlooking Chippewa in South Saint Louis. The whiteness of the painted brick tends to de-emphasize its physical materiality abstracting the form as a cubic mass, rather than as a structure assembled from many separate modular elements. The horizontal banded bricks at the building corners tend to provide shadowing which relates to the adjacent dark band of glazing. This detail aesthetically breaks the corner, while still allow for the load-bearing condition. As is typical in Armstrong's work, attention has been paid to the composition and selection of plant materials to complement and accentuate particular aspects of the design. The evergreen plantings surrounding the house at grade emphasize the overall horizontality of the composition, while the two vertical junipers accent the subtly emphasized vertical mass designed to contain a fireplace and chimney. The planters located on the roof are signature Armstrong elements which help to ground the ethereal, futuristic lightness of the house.